The field was baked to that late summer color of overcooked green. It couldn't have been more than a few short minutes. I'd stretched myself out in that tall summer grass...thinking I'd just close my eyes and soak it all in. The sounds and smells. The feel of the hot sun. I'd fallen asleep. In every which direction. They were a mix of the late afternoon light...dancing shadows..and the most exquisite of silken thread. 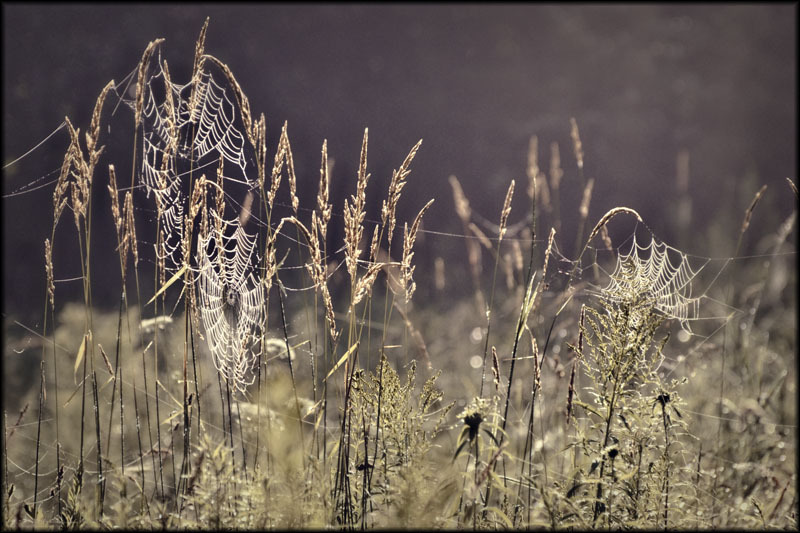 Little magical webs.. intricately intertwined and interconnected. Each and everyone exquisite and unique. Magical little dream catchers..collecting dreams and hopes and wishes. Honoring and respecting them. Allowing them space to breathe and grow. Holding them up to the light. And then I awoke...and just in the right time. All of those little dreams and hopes and wishes were flitting and flying and making their way into the setting sun. They were free to become.